The 1970s was the era of the cafe racer in its second phase, that of the specialist manufacturers. Certain mainstream marques such as Ducati, Moto Guzzi, Laverda and Yamaha also catered for this emerging market by producing production factory cafe racers such as the 900SS (Ducati), Mongich (Laverda) and RD Series (Yamaha). Among the names which flourished in this environment, and which are the subject of this book, were Dunstall, Gus Kuhn, Seeley, Rickman, Bimota, Magni, Dresda, Munch and Van Veen…and others whose names are perhaps less well remembered, but who were just as dedicated to the ideal of personal creativity. 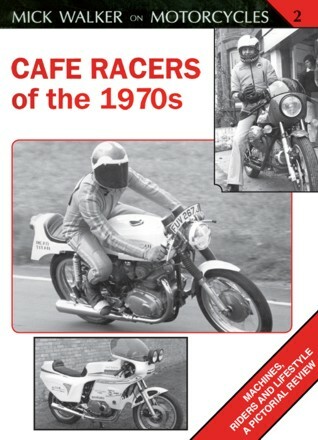 Famed motorcycle author Mick Walker graphically recreates the era of the cafe racers. Numerous contemporary photos are featured, with captions explaining the history and technical features of the machines and describing the men who made and rode them. To read this book is to experience a period of true individual genius and innovation. Enjoy!